Philadelphia, Pennsylvania—home of the cheesesteak (and its vegan offshoots), the Liberty Bell, and fellow marketing team member Morgan. I’d only been once, in middle school, when all I cared about was seeing the house where “The Real World: Philadelphia” was filmed, before my trip down in December to tour the studio of ceramic artist Brian Giniewski. 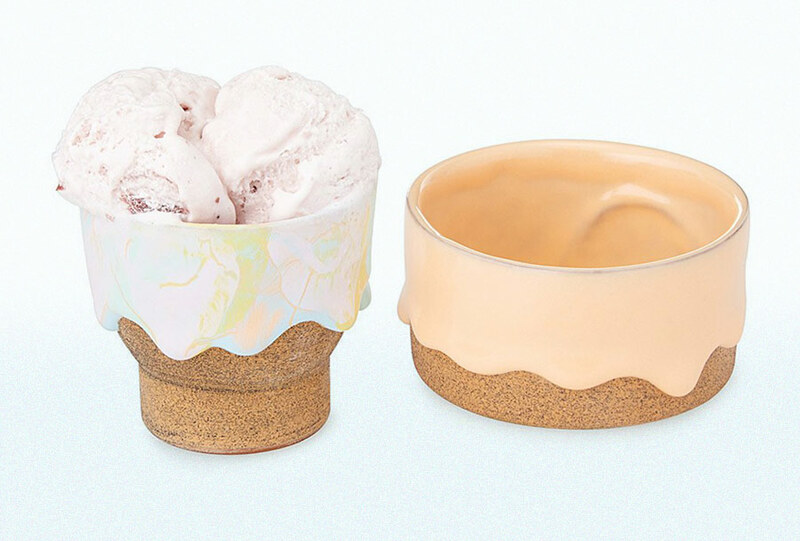 In a far-off corner of the city once known as a center for textile production, Brian makes delightfully drippy vessels perfect for housing fully-loaded scoops of ice cream, each glazed in tantalizing shades like “pop rox,” “creamsicle,” “saffron,” and “peach.” I know they’re made of clay, but I’ve gotta be honest: they made me hungry—and actually, they still do. But I digress. 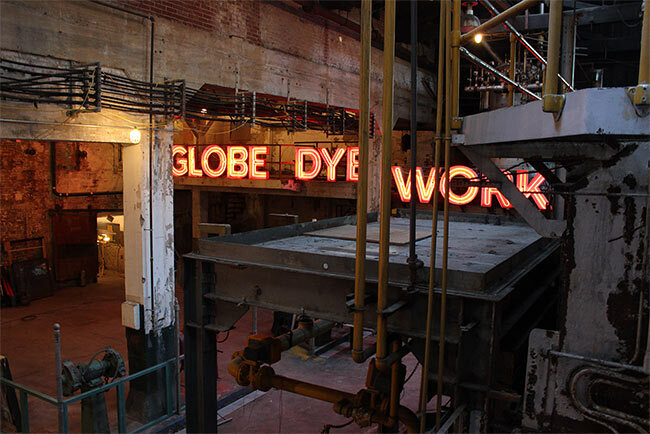 Accompanied by my trusty companion, Royce, I followed Brian through the halls of Globe Dye Works, a yarn-dying factory-turned-artistic community that houses tenants like the Philadelphia Wooden Boat Factory, Rival Bros. Coffee (I had some, and it was quite good), and, of course, the artist himself. 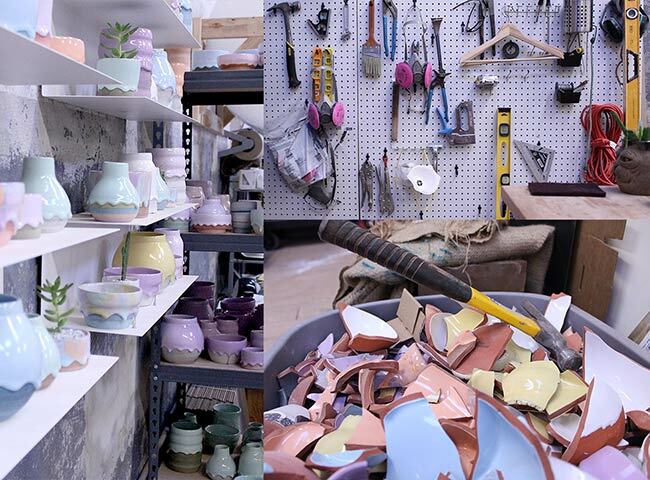 Remnants of the building’s industrial days lined the path to Brian’s workspace, where a seemingly endless supply of shiny, textured mugs, plates, and planters mingled with tools of the trade. 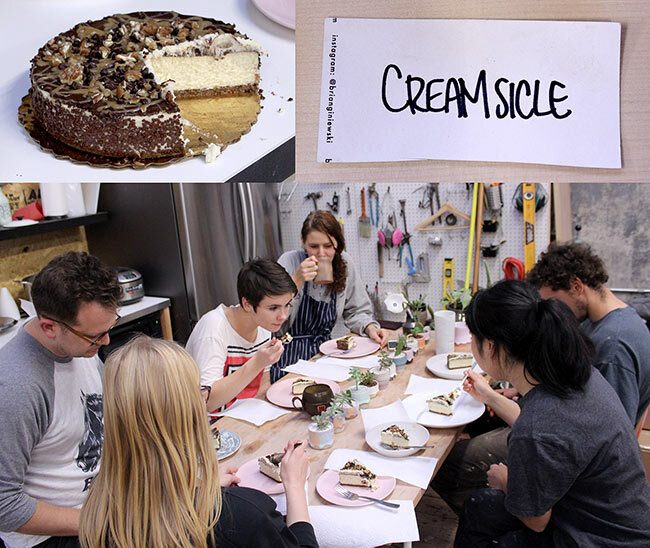 After a tour of his sunny studio, Brian threw a quick piece for us—an act that may as well have been magic to me—and invited us both to indulge in “Cake Time,” a staff tradition that pretty much speaks for itself. One slice of chocolaty cheesecake and a good old-fashioned sit-down later, Royce and I took our leave, equipped with a handwritten list of must-try Philly lunch spots (tehina milkshake, anyone?) 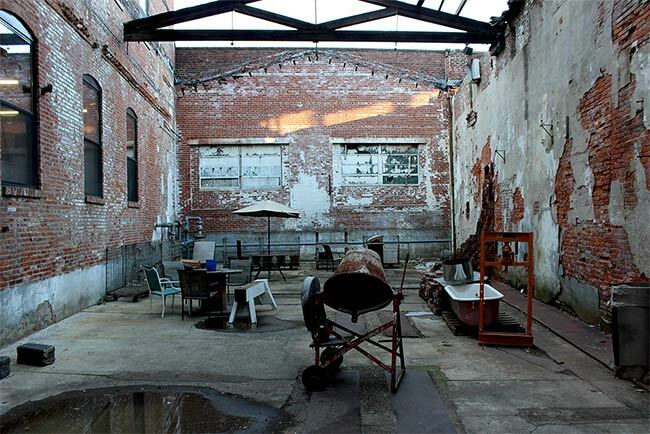 and a directive to stop by Field, a plant-centric pop-up in Philly’s hip Fishtown neighborhood, for First Friday. 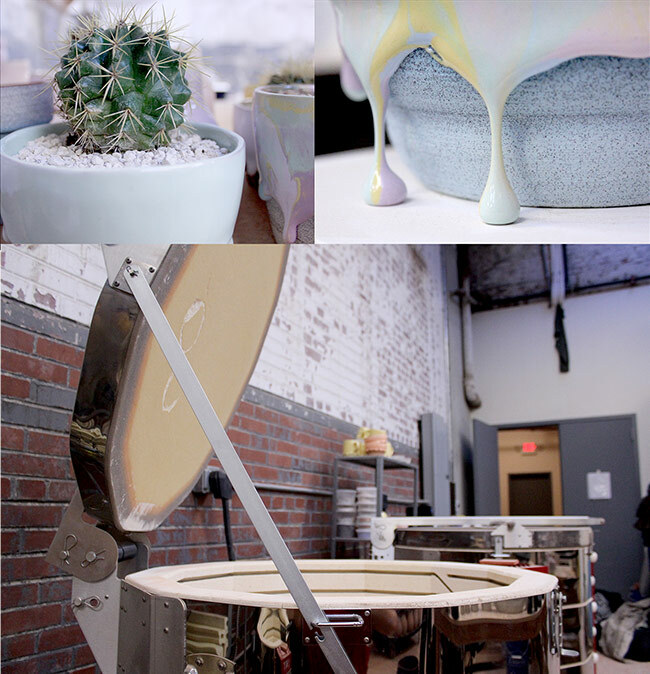 Itching to know more about the guy behind our Drippy Ice Cream Bowls? 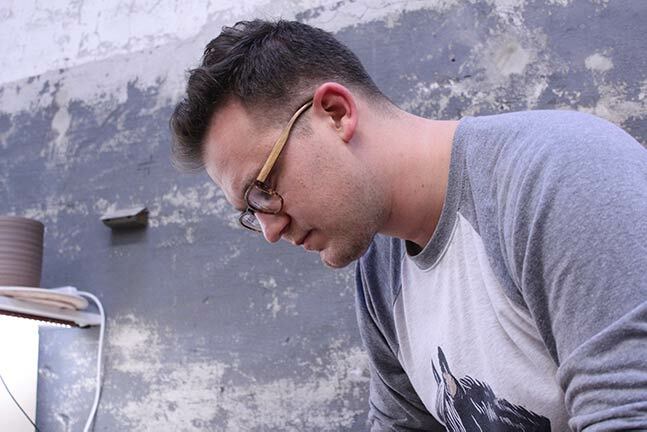 Read on for our Q&A with Brian, plus a selection of photos from our visit to his space. 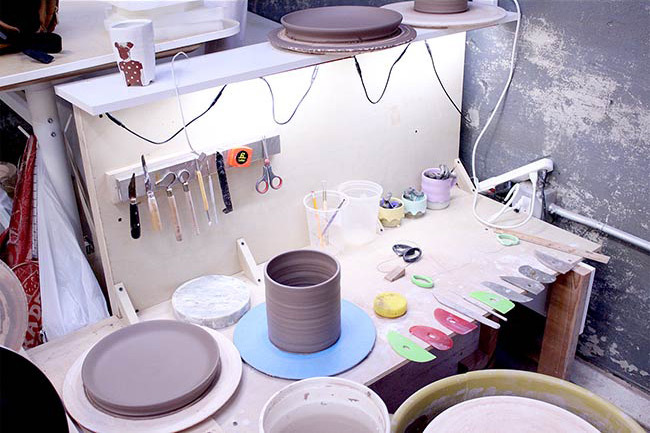 How and when did you first develop an interest in ceramics? I grew up in rural Pennsylvania, a few hours outside of Philadelphia. I didn’t have a lot of exposure to art as a kid, and I never really considered it to be something that I had any talent in. I got really interested in playing the guitar and drums in high school, and a bunch of the guys I would play with were getting pretty good at throwing pots in ceramics class. I went along with it at first as a social activity, but I quickly got really serious about trying to build my skills. It was one of the first times that I had a profound experience with visual art. High school was not a good time for me, but the ceramics teacher at my high school set up the studio as a safe, no-intimidation space for students to work and explore. She was really supportive, and I loved the challenge of throwing on the wheel. While it was frustrating at first, it is a process that rewards repetition and it’s very easy to see your own growth and development as you build your skills. You initially enrolled in college to study accounting. What prompted you to make the switch to a more creative pursuit? 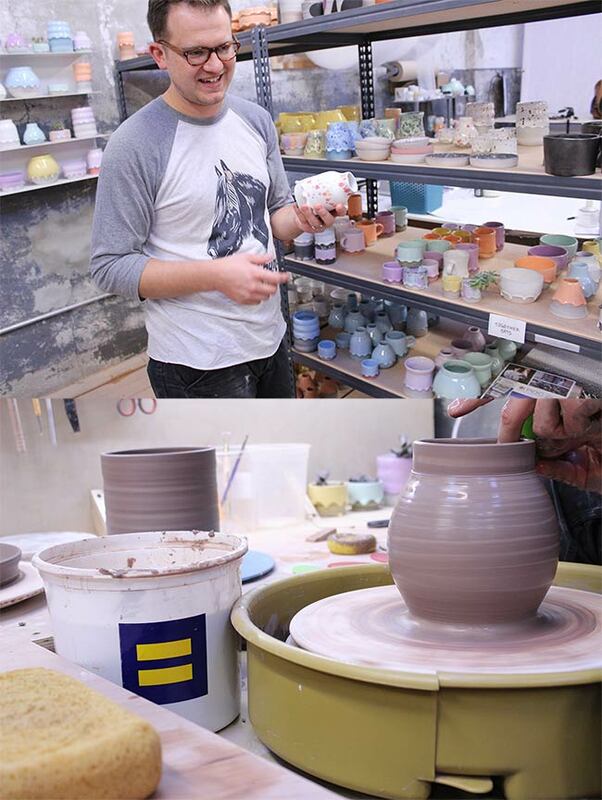 After falling in love with ceramics in high school, I chose to pursue a Bachelor of Fine Arts in Ceramics at Millersville University in Lancaster, PA. I later went on to study at the Cranbrook Academy of Art in Bloomfield Hills, MI, and received my Masters of Fine Arts in 2009. I initially thought that I wanted to study accounting in college because I found the process very systematic and rewarding. I like thinking of problem solving in terms of constants and variables. There are things that will always be in flux, so developing efficient systems of organization and processing information helps to keep things in order. Art-making is a very different process. In is best moments it is messy and hard to categorize. My biggest ongoing challenge as an artist and designer is to embrace the unknown + undefined while maintaining some sense of organization and consistency in my process. I realized early on in college that I crave the tangible, physical nature of creating with my hands, and working behind a desk would never fully satisfy me, no matter how interesting the material is. I have always been challenged and fascinated with the potter’s wheel. 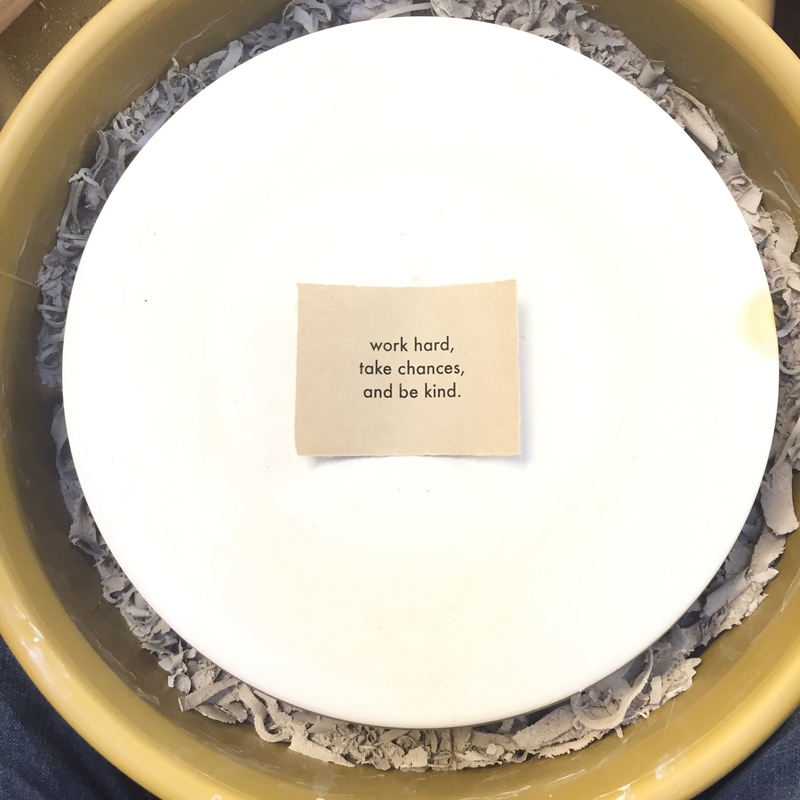 The practice of throwing a pot on the wheel is exceptionally difficult to learn. From my first time trying to make a pot, I was determined to improve and master the process. Fifteen years later, I’m still working on it! Besides the potter’s wheel, I am a sucker for a well-designed gadget. I have lots of little hand tools here in the studio that I have either bought or made. I’m particularly partial to Japanese and German knives and measuring tools. It takes a full 30 days for a piece to get through the studio from start to finish. … When we come into some kind of production problem [in the studio] and we don’t know how to solve it, we end up just building something around it. 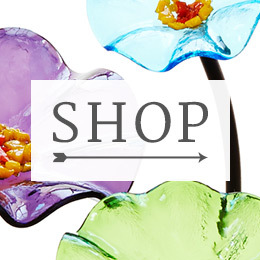 How did you come up with the idea for your signature drippy vases? Back in 2012, while I was a resident artist at The Clay Studio in Philadelphia, I was offered a commission to make 250 bud vases for a 1960s psychedelic-themed gala event to honor a local gallery owner. I started developing my signature glazes for that project, and I loved the indulgent use of color and texture. The response to that initial series was so positive that I kept working on them. It took me until 2015 to decide to turn it into a full-time career. I’m [always] trying to figure out how to exploit the fluid nature of [the] glaze and really get it to do something that kind of defies the look of ceramic. A lot of times, people don’t even know what the material is, and they think it’s wax, or plastic, or something like that. Before I was doing this line exclusively, I was making a lot of sculptural stuff. … I really thought that this was a one-time commission thing. I was really happy to take the commission, and I thought, “Oh, this is great—this is going to give me a check that I can use to do another exhibition of sculptural stuff.” … There is something about the art school mentality that tells us that making a beautiful thing that people want to have in their homes is like selling out, or is somehow not good enough, and I was so deep in that line of thinking. … So it really took me, like, five or six years out of graduate school for that kind of brainwashing to wear off and be like, “Well, this is actually a great thing—that somebody likes this beautiful thing that I’m making, and they say that they want to own it, and they can actually afford it.” That’s a great thing that we’ve accidentally stumbled on. How does your studio space inform your work? My studio has amazing light! There are eight skylights in here, and the work looks very different throughout the day. More than anything, all of the natural light helps to keep me in a happy, positive mood, which is want I want my work to project in to the world! I work a lot, and I am notoriously bad about giving myself downtime. When I do find time to relax, it almost always involves food. We built out a nice little kitchen here in the studio, and my assistants and I eat a healthy home-cooked meal together every day. It’s a great time for us to catch up on what’s going on in our lives outside of the studio, and also to talk about deadlines and expectations for the rest of the day. Do you ever work in other media? I love to draw and paint. In fact, the color story of my current work is a direct response to a lot of drawing and painting that I was doing before I started making these drippy pieces. I was so unsatisfied with the bland, neutral colors of most pottery, so I decided to start developing my own unique glaze recipes! Being your own boss is very exciting, but it can also be terrifying. When things go wrong, the responsibility is yours at the end of the day. Fortunately for me, my wife Krista has been invaluable in helping me start and grow the business to where we are today. She is intensely organized, a world-class multi-tasker, and an excellent creative problem solver. She didn’t know anything about ceramics when we first met, but now she’s better than me at some studio tasks! What advice would you offer the you of five years ago? Making beautiful things that people want to live with is not a bad thing. Art school has a way of distorting our perception of what art can be. While I also loved making fine art objects for galleries and academic discourse, I am exceptionally satisfied to make my living making accessibly priced handmade items that make people happy. I only make short-term goals these days. In the year and a half that I’ve been running the business as my full-time job, everything is constantly changing. I’m really lucky that people are paying so much attention to ceramics right now. 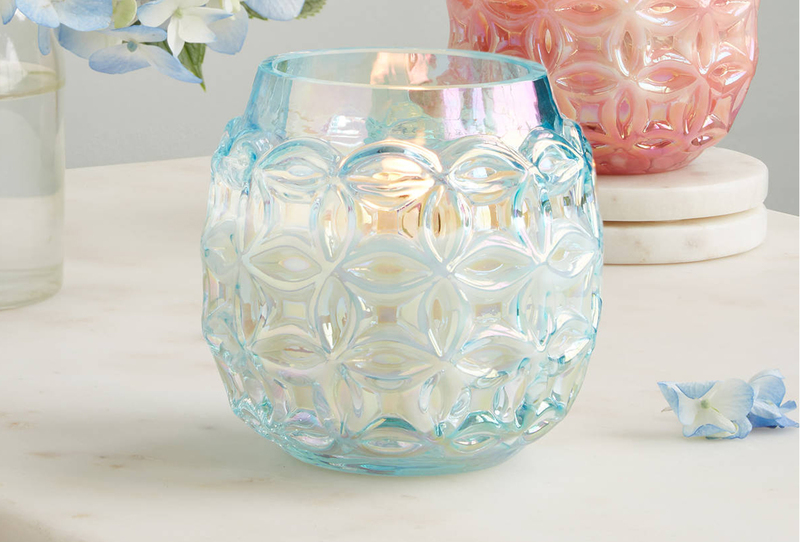 Like, ceramics is having such a moment. Rather than trying to plan too far in to the future, I am saying yes to every good opportunity and focusing on making good products and taking care of the people that allow me to do that. Do you have any exciting new projects on the horizon? There are always new ceramic forms and surfaces in the pipeline, but I really hope to release a small line of clothing and furniture in 2018! We’re getting to know a lot about our audience and customer, [and] we really want to start building a world around this stuff. Some of my favorite designers think in that way—like, it’s not just the objects; they’re building a whole world and a whole language of design around their vision of what these things can be. The most meaningful type of collaboration these days happens with my wife. She has Wednesdays off from her real job, so on those days we work together alone in the studio. We bounce a lot of ideas off of each other and try to encourage play and experimentation. 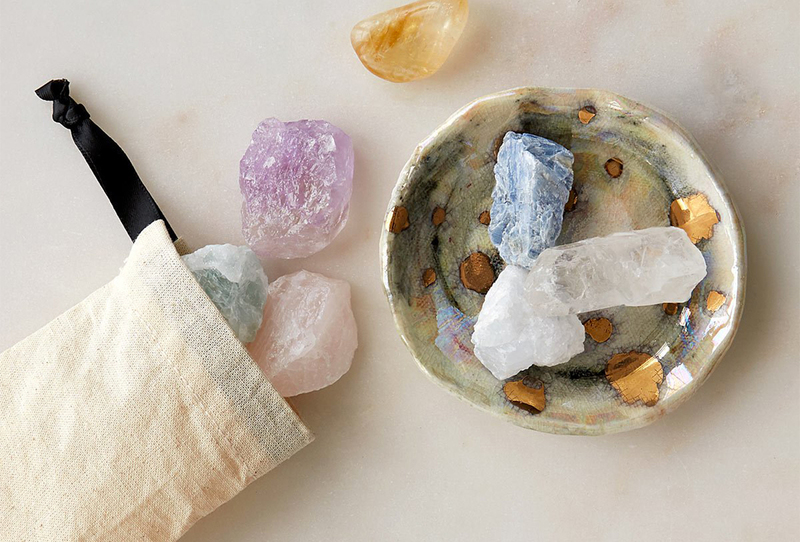 Many of my favorite pieces that we make (Sherbet and Stardust pieces for example) are a direct result of experiments that Krista and I tested in the studio. I spend so much time on the logistical and organizational work of running a business that any time I get to do hands-on work is a treat. My favorite process is experimenting with new forms, making prototypes, and building tools to solve specific problems in the studio. Victories are always celebrated with food. We will have an extra special staff meal (including something we like to call “Cake Time”) and/or Krista and I will treat ourselves to dinner at one of our favorite restaurants here in Philly; Serpico, Zahav, or Royal Izakaya. I have always been inspired by fashion, especially the colors, textures + patterns of fabric. I have recently been taking some sewing classes at Butcher’s Sew Shop here in Philadelphia. I love learning new ways to make, and I can’t wait to see how these new skills manifest themselves in my practice. Finally, what’s your favorite thing you’ve ever made? 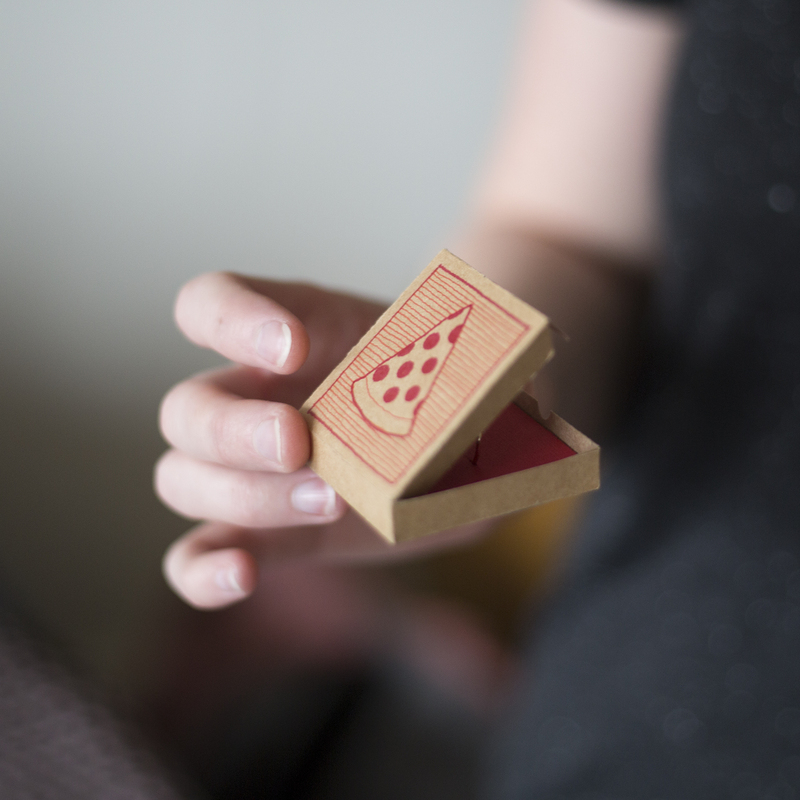 The best thing I’ve ever made is this miniature pizza box that I used to propose to Krista. 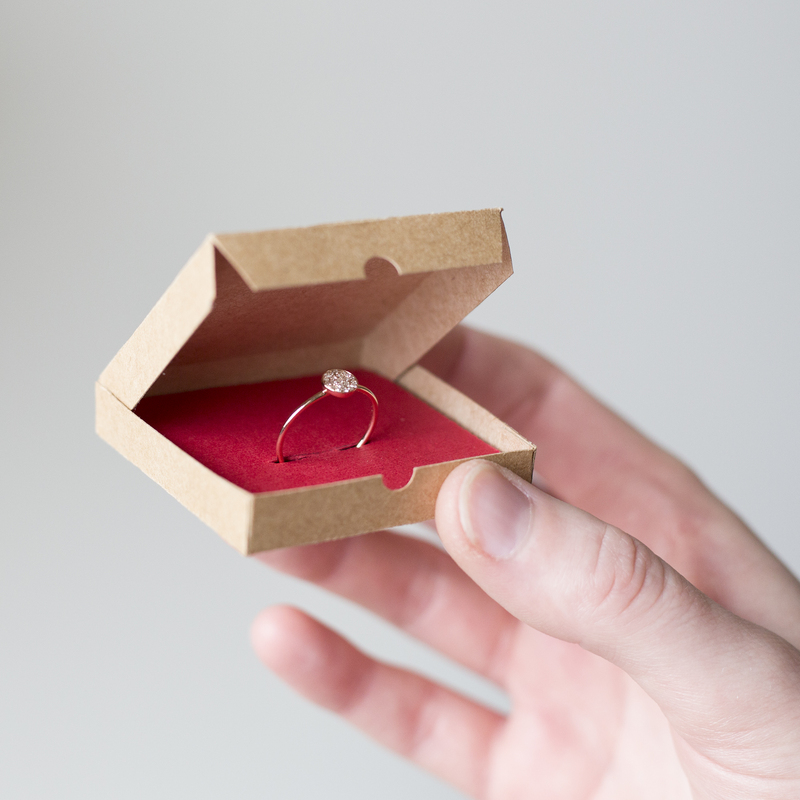 I was so nervous about destroying it before the proposal that I made two backups!